Spiders are creepy bugs that most people fear. Since common spiders tend to look like one another, it’s best to consult a spider extermination professional to make sure your spider encounter isn’t poisonous. House spiders are commonly mistaken to be brown recluse spiders. Unlike their lookalike, house spiders are not dangerous to humans. How long to spiders live? Most spiders live for about 1 year before dying off naturally or being eaten by predators. Big tarantulas can live 15-25 years in captivity. All spiders are hairy! They use their hair for sensing the environment, moving around, courtship displays, and prey capture. They’re able to detect vibrations and currents on their webs and make up for their poor eyesight with their hairs. While spiders kill their prey through venomous bites, most do not attack humans. The two spiders that humans should avoid getting bitten by are the brown recluse and black widow; their bites can cause necrosis and death if left unattended. Spider silk is among the most elastic and strongest of natural fibers (which is why that web seems to never come off you when you walk through one). In fact, synthetic spider silk has proven useful in creating the next gen of parachutes and bullet-proof vests. Cool, right? 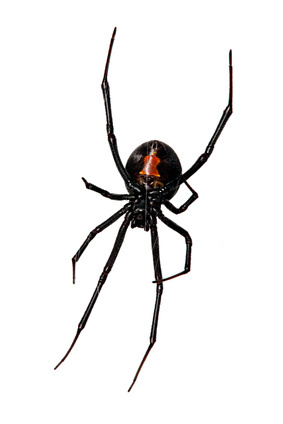 A female black widow can be identified by a prominent, red hourglass shape on the under side of its abdomen. There are a few species of spiders that have similar markings, but if you see something close to it, you should steer clear. They typically come from the warmer climates, but can be brought here on furniture or other items that come from the south. A male black widow is brown and is a bit smaller than the female, but it is not poisonous. These are typically found in the south eastern part of the country, but have been seen here occasionally. They can be identified by a prominent violin shaped marking on their backs that give them the name “Fiddle Back”. They also have just 3 eyes where a typical spider has eight eyes. This is the most common poisonous spider that we have in the Portland Metro/ SW Washington area. They are larger, brown spiders with a darker V-shape on its abdomen. They look strikingly similar to a non-poisonous Giant House Spider. A Giant House Spider has similar markings, but can be distinguished by the darker colored joints on its legs. Since they are so similar looking, we would advise having a spider treatment if you are not sure.